Google Sheets has a built-in function called ImportXML which will import pieces of structured data from a webpage to a Google Sheet. You can use this function to import almost any publicly available information (unfortunately you can't use it with websites that you have to authenticate to). I manage multiple Twitter accounts but they’re all for different parts of the same company. Instead of displaying a individual Twitter Follower Count widget for each of my different accounts, I want to show the total number of all our Twitter followers in one widget. 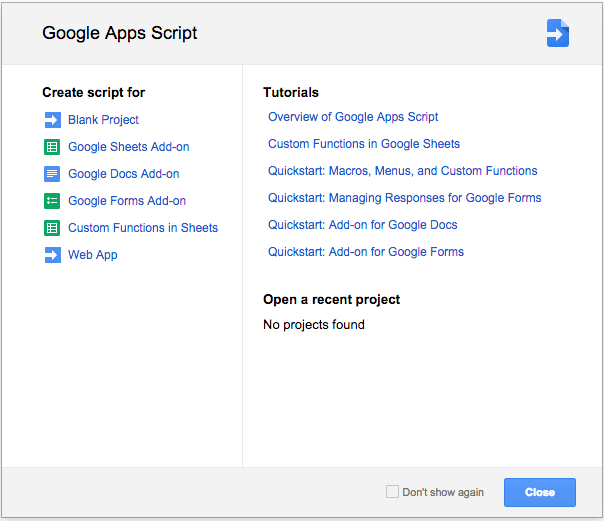 The answer is to use the Google Sheets function, ImportXML. In this article we’ll work through a similar scenario and explain how to use the ImportXML function of Google Sheets to import how many likes our Facebook page has and how many followers our Twitter page has. This function doesn't update on its own by default so we've written a script that we'll explain how to adapt to ensure your data is kept up to date. The URL of the page to examine, including protocol (e.g. http://). The value for URL must either be enclosed in quotation marks or be a reference to a cell containing the appropriate text. The XPath query to run on the data given at the URL. Each result from the XPath query is placed in its own row of the spreadsheet. How does the ImportXML function work? We recommend working through the first 4 chapters of this blog post as it will give you a really good basic knowledge of reading source code and interpreting HTML, XPath and the ImportXML function. We are aware that there are a few screenshots missing in Chapter 4 of the blog post, but this shouldn't affect the overall learning. Once you've got your head around these things, come back to this article and we'll explain how you can use your newfound knowledge to the benefit of your Geckoboard dashboard. Navigate to our Twitter feed http://twitter.com/geckoboard (we’re using Safari in our example). Right-click on the page and click Show Page Source. We’re looking for the Follower count in amongst all the code so click inside the code that appears and press Command + F (or Control + F) and type in "followers". The screenshot below shows the section of the page source that forms the image above e.g. Tweets, Following, Followers, Favorites. Our goal is to find something in the source code that uniquely identifies the number of followers we have. On closer inspection we can see that, inside the <a> tag, is an element called data-nav=”followers”. This element is our key to importing just the piece of data that states how many followers we have. To pull out this data we’ll use the XPath query //a[@data-nav='followers']. This finds all the <a> tags in the source code and imports any with a data-nav=”followers” attribute. As we’ve discovered, this is only used once in the source so will only import one result into our Google Sheet when we write our ImportXML function. We’ve written Twitter in Cell A1 simply as a heading to explain what data will be found in the cells next to it. The word Followers is imported into cell B1 and the number of followers into cell C1. We haven’t done anything special to make this happen, this is just how the data has imported. However, it’s really fortunate as it leaves the number in its own cell which will make it easy to do calculations on. Navigate to our Facebook page:https://www.facebook.com/Geckoboard. This time we’re looking for the number of likes in amongst all the code so click inside the code that appears and press Command + F (or Control + F) and type in the number of likes we have e.g. ‘1,275. When we did this it brought back just 2 results (whereas searching for the word 'likes' brought back 61 results). Again, the goal is to find a unique identifier that will import just the number of likes we have on our Facebook page. Through some trial and error we found that, inside the <span> tag, was an element called id="PagesLikesCountDOMID" and this just pulled out the number of likes our Facebook has. The XPath query will look like //span[@id='PagesLikesCountDOMID'] which will find all the <span> tags in the source code and imports any with the id="PagesLikesCountDOMID" attribute. We’ve written Facebook in Cell A2 as a heading to explain what data will be found in the cells next to it. these next steps do not follow on from the examples above and you can disregard these examples now. In a new Google Sheet, the first thing we'll do is split the ImportXML function into two logical pieces; the URL and the XPath query. Write the URL in cell A1 and the XPath query in cell A2. If you want to add another ImportXML function into this sheet so that you can do calculations with the data, add the second URL in cell A4 and the XPath query in cell A5. Give your Google Sheet a name. To write a script, click on the Tools menu. Select the option Script Editor. In case you're wondering why we're adding a random number to the end of our URL, it's because otherwise the website will be cached and the function stops importing the latest data. The ImportXML function for our Facebook likes has put the number of likes and the word "likes" in one cell so we’ll need to split into separate cells before we can do a calculation on the number of likes. We’ll use the Google Sheets Split function to split the text in cell C2 wherever it finds the space character. 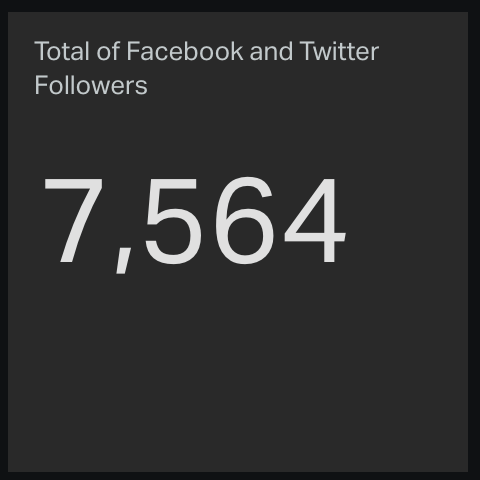 Now that both the number of Twitter followers and Facebook likes are in their own cells, we’ll add a ‘Total’ heading in cell A3 and then use the Google Sheets SUM function in cell B3 to add these two results together and give us an overall total. At this point, give your Google Sheet a name. 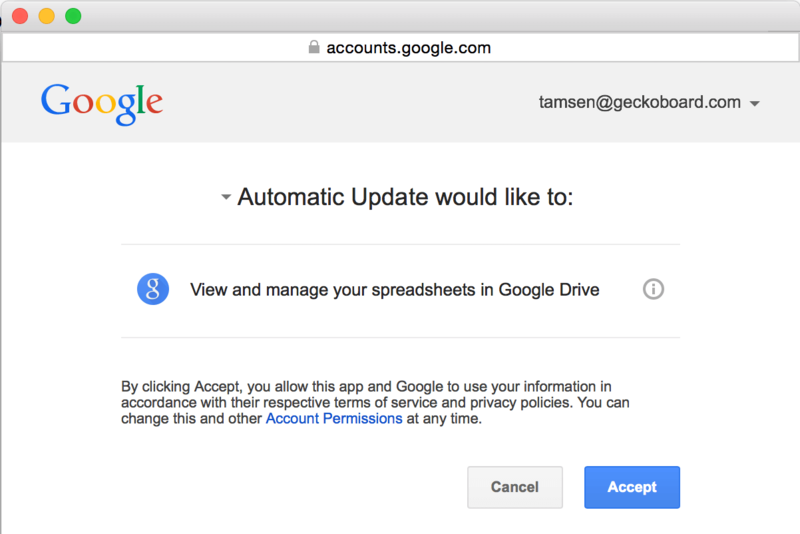 Select the Google Sheets file that you've just created (ImportXML - Automatic Update in this example). Type C4 in the Number selection (which contains the total value of likes + followers in the above example). Configure the other widget options. Disable the Comparison Visualization and adjust the title. 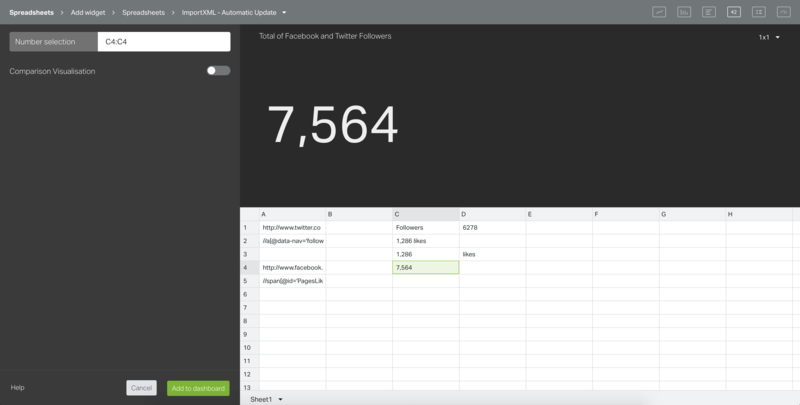 The Geckoboard dashboard is now displaying the information found in Cell C4 of the Google Sheet - our total Twitter and Facebook followers. 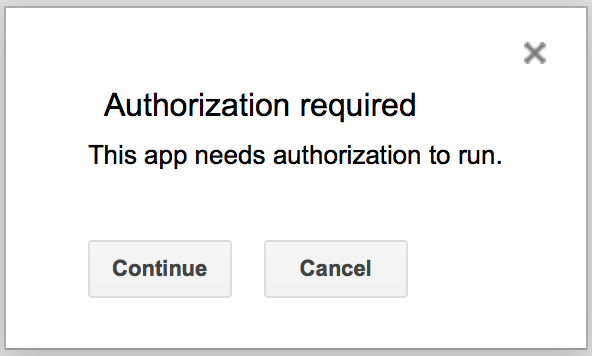 We've found that a few times a week, a server error will occur on Google's end and the script will fail to run. By default, you'll receive an email to notify you that this has happened. Considering the script runs every minute of the day which totals 1440 times, a few times a week is nothing to be concerned about.